When I was 15, I finally talked my mom in to letting me wear makeup. So my aunt took me to Macy’s and got me a Lancome makeover and bought everything I needed. I loved that Lancome makeup and in fact still do but it does get a little pricey. When I was in high school I would get up extra early every morning to do my makeup. In college I wore it sometimes but not a lot. A true southern belle would never admit to this, but now I hardly ever wear makeup. So I hate paying big bucks for makeup that just sits around waiting for me to use it. So a few weeks ago I purchased some of that E.L.F. Cosmetics. This stuff is dirt cheap like the most expensive thing being $6.00. So you get what you pay for right? Well I’m not so sure about that. I was really impressed by their products. I love the way their makeup makes me feel and how it looks on me. I have a hard time finding makeup to match my skin but I feel like this makeup blends good and does not make me look orange. 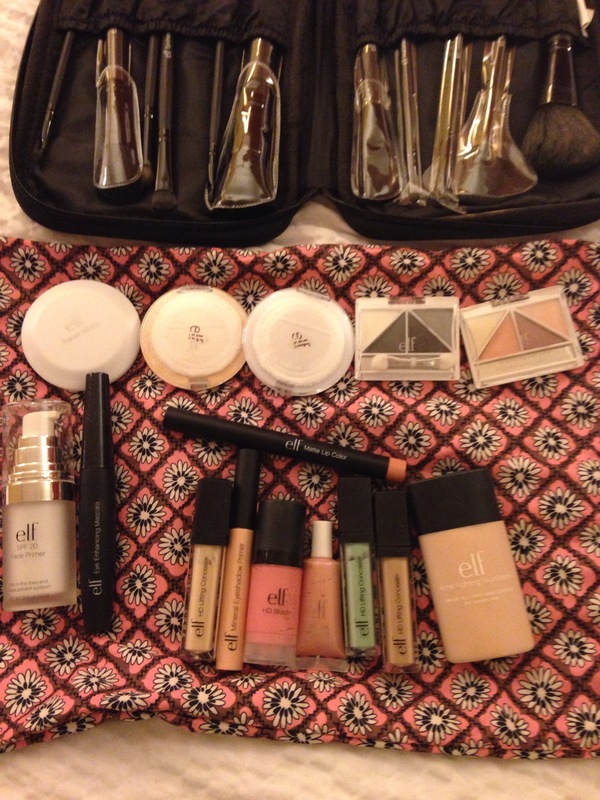 So if you are in the market for a cheap makeup I would totally give E.L.F. a try. It’s hard to believe that it’s been six months already since the kids moved back home from South Dakota. I have loved almost every minute of them being back. The five-year old is so attached to us now that she starts bagging her mom to see us when it has been a while. The ten month old reaches for us now because he too is so used to us being around. After the first time we took the five-year old to the local museum center (Children’s, History, and Local museums) she was addicted, so much so that we bought a pass so we can take her over and over. The newest thing the five-year old wants is for us to take her to Disney World. And my dad, of course is considering it. I have even watched both of them one day when the ten month old was sick and couldn’t go to day care. Both of the kids birthdays are coming up in the next few months and we will be able to see them for their birthdays and Christmas! I love these kids so much! And now there is going to be another one! Early next year number three will be joining the mix. Wow! That is going to be crazy but fun. And we will be able to see the new baby as soon as he or she arrives. I’m going to need a bigger car and we are going to need another car seat! Well I did it. I purchased the book Gone Girl to read. It’s not my typical kind of read but I’m interested to see what all the hype is about. I hope it is as good as everybody says it is. And it may take me till next year to finish it but we will see. I’ll keep you posted. To me High School was just four years of my life that got me to college. There are only a few people from High School I still keep in touch with and with that I am just fine. But these past few days I have been thinking about High School a little more. I learned the other day that someone I went to high school with had passed away. I was not friends with this person nor have I seen them since high school but it still saddens me. I am 30 years old, people I went to high school with should not be dying. We are in the prime of our lives and to be taken for whatever reason/reasons is just not right and to be frank it is scary. I love that all my favorite shows are back from the summer break and are fresh with new episodes, but there is one show I am really missing right now, Hart of Dixie. That’s right I am missing Blue Bell, AL! I can’t wait to catch up with Zoey, Lemon, Wade, George, Brick, Levin, Meatball, Magnolia, and so on. A few years ago when I started watching it on Netflix I never dreamed I would become addicted to the show. I can’t wait for the shortened season to finally start, whenever that may be. I hope this new season does not disappoint. I hope the new season gets here quick, I need to return to Blue Bell and my southern friends. I will be the first to tell you, I am not liking this new NASCAR Chase format one bit. Why change something that was not broken? I love NASCAR and have been a fan for many years now but this new chase format is about to turn me away from the sport. I don’t know how other fans are feeling but it makes no sense to me. At least with the old way a driver had a chance till the very end as long as they were in striking distance. Not now! Now they have to make it through rounds. So a bad race in one round could be your chance is over where with the old way that was not the case. I want the old way back!